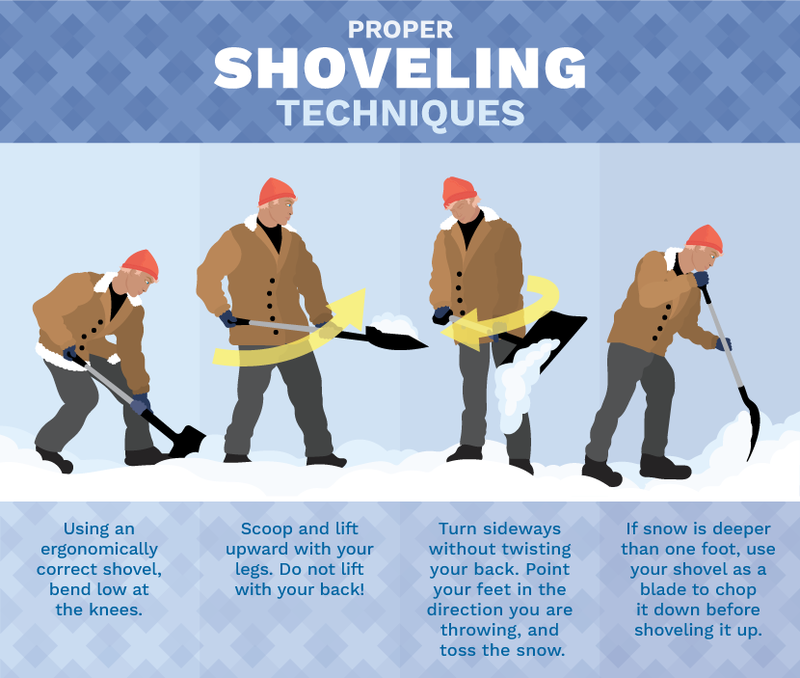 As another blizzard just hit New York, Brill Physical Therapy collected some useful tips to keep your back safe, while clearing the sidewalk, or your driveway. First and foremost warm up is important, especially for muscles of your low back and hamstrings before going outside to shovel snow. The reason is that cold muscles are more prone to injury. One option is to start by placing a hot water bottle or heating pad on your lower back for 10 to 15 minutes, followed by some light exercises, such as bridges, squats, heel raises, cat-cow, etc., to increase blood-flow to the desired muscle groups. Then stretch the hamstrings gently by sitting at the edge of a chair, straighten one leg in front of the body with the heel on the floor. Then, sit up straight and bend forward. Hold this stretch for 30 seconds. Secondly, choosing the right shovel is crucial. This can help to take some of the effort out of snow removal by allowing you stand straighter and lessen stress on your back. Consider using a shovel with curved handle. If the length of the handle is also adjustable, that’s even better. This will minimize the degree to which you need to bend forward when shoveling. The weight of the shovel is another factor to consider. Thirdly, pay careful attention to your form. Bend at your hips and knees, and make sure that you keep your core muscles engaged, while you lift with your leg muscles, rather than your back. Avoid twisting your torso to move the snow to its new location, always pivot your whole body to face the new direction. Keep your loads light. Last but not least, slow down. Slipping on snow or ice is a serious concern, and can lead to serious injuries, such as concussion, or spinal fractures, etc. Be sure that you spread sand, rock salt, sawdust, or kitty litter on your driveway and walkways to improve traction, and wear appropriate footwear with good treads.